Are you creating more marketing videos this year? Most marketers say, yes, and most prefer YouTube over Facebook (87% vs. 68%). If video marketing is on your to-do list for this year and you want to know which channels drive the best ROI, read on to learn some curious stats on the state of video marketing in 2018. YouTube owns the hearts and wallets of marketers, who use the platform to raise awareness, educate consumers about a product, or drive them to purchase. 87% of surveyed marketers have published video content on YouTube. Out of those, 90% found it to be “an effective strategy,” according to Wyzowl. Facebook’s numbers are a little less impressive. 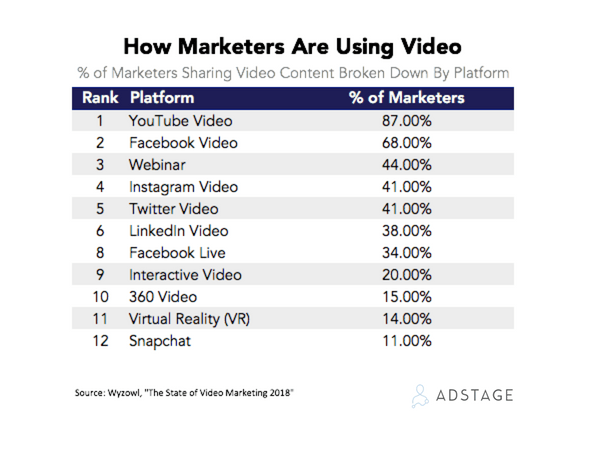 68% of marketers have published video content on Facebook, and out of those, 87% found it to be effective. 70% of marketers plan to use Facebook Video in 2018, compared to 87% for YouTube. The survey results show that just 39% of marketers are publishing video content on Twitter. Out of those, 70% found it to be an effective strategy. The trend will likely stay the same: 40% of marketers plan to use Twitter video in 2018. The results are even lower for LinkedIn: 38% of marketers have published video content on the professional social network. Yet the perception of ROI seems to be in LinkedIn’s favor, compared to Twitter. Of those who used it, 75% found LinkedIn to be an effective strategy. So the future looks promising: 55% plan to use LinkedIn video in 2018. Facebook’s vigorous promotion of Live Video through partnerships with major publishers last year was semi-successful. Only 34% of marketers used Facebook Live in 2017. Of those who used it, 81% found it to be effective. Nevertheless, it shouldn’t come as a surprise that only 37% plan to use Facebook Live in 2018, as the numbers on user engagement with Facebook Live have been historically low. 14% of marketers used virtual reality (VR) video in 2017. Of those who used it, 67% found it to be an effective strategy. Just 14% of marketers plan to use VR in 2018 (the report doesn't specify whether these are the same 14% of marketers who said they used it last year). While those numbers may seem unimpressive, wait until you see the stats on Snap, Inc: just 11% of marketers have used Snapchat video. Of those who used it, 27% found it to be an effective strategy. Looks like marketers are hesitant to put money into the platform that’s built a reputation for promoting content that only lasts a couple of seconds. Perhaps the promise of ROI appears just as ephemeral: only 9% of marketers plan to use Snapchat video in 2018. 5. Move on, brand videos. Product explainers actually close deals. Product videos are now key at the conversion stage of the buying cycle. According to the survey, 95% of people have watched an explainer video to learn more about a product or service. 81% of people have been convinced to buy a product or service by watching a brand’s video. 97% of marketers say that video has helped increase user understanding of their product or service, compared to 76% who report that video helps increase sales and traffic. Not just for onboarding anymore, explainer videos are especially helpful if you consider that 81% of people make their purchase decision based on online research (the percentage is even higher for B2B buyers - as many as 94%). Even though the cost of video production is going down, marketers' expectations of ROI are higher than before. The percentage of marketers who say video gives them a good ROI is down 5% from last year (78% in 2018 vs. 83% in 2017). Facebook and YouTube are winning the video battle also because the ROI is easier to track (ROI measurement is something that Snapchat is still struggling with). 80% of marketers say that video has increased dwell time on their website. Time on site is cited by Google as an important SEO ranking factor, so marketers who invest in creating more video content may quickly move their websites up in search results. And the demand for this type of content is certainly there: the average person watches more than an hour and a half of online video content per day, with around 15% averaging more than three hours, according to the report. More budgets are shifting to video, on every channel. 81% of businesses use video as a marketing tool (up from 63% in 2017). 10. Most people would rather watch a video than read. This sums it all up pretty well. Ad dollars will go where people go, and they actually prefer to stay -- on the pages containing videos vs. text. Not surprisingly, when both video and text are available on the same page, 72% of people would rather watch a video to learn about a product or service. 85% of people say they’d like to see more video from brands in 2018.